It’s difficult to guess by the first look that the device belongs to the office equipment. It’s rather possible to take it for a hi-tech equipment, used for carrying out specialized biology researches, due to the low-profile design and the transparent top board. Undoubtedly, the HP Envy 120 e-All-in-One is manufactured, using the latest technologies. But thus it is a multifunctional printer for home. However, the design of the device prompts: it is possible to expect more than plain text printing. Its classical black color and rather strict style will perfectly fit any interior. To manage the device the impressive 4.33-inch color touch screen is used. Points of the menu are clearly recognized. The printer possesses a broad range of advanced features, one of which is a Secure Digital 512 Mb memory, enough for even the largest images or PDF-documents. The essential pro of this model is that it can automatically duplex (and reduce paper consumption). 4 color or 7 black-and-white pages per minute is a sufficient speed for home (in draft mode – 23 and 28 pages respectively). The maximum resolution in black/white – 1200 dpi, in color – up to 4800 dpi. The cartridges to this special HP Thermal Inkjet technology printer are of two types – black and tri-color (an independent replacement). High-yield XL cartridges are also available as well as free recycling program. The quality of the output is really unprecedented. It is easy to receive an excellent professional-like photo at home in about a minute. Photos are fade-resistant, they are printed without white margins on A4 or US Letter-pages. It is pleasant to print even on envelopes or greeting cards. The direct printing from MS Duo and SD-cards is available (put one in the slot and you’ll get the photos from your camera automatically). The device is almost silent. So you won’t wake a sleeping child while printing the last-minute documents. 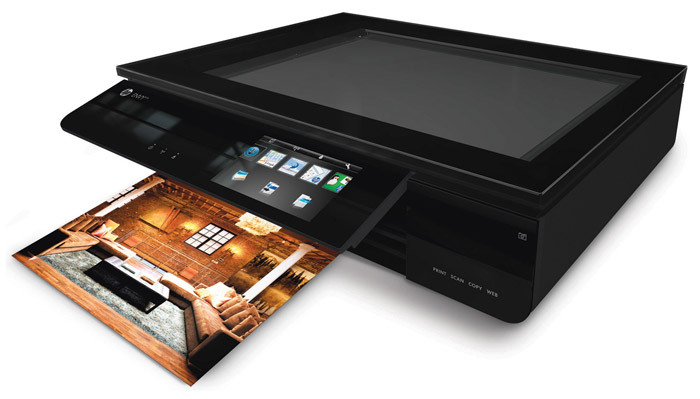 HP Envy 120 e-All-in-One possesses a tablet scanner, coping with scanning of black-and-white and color documents with the resolution of 1200 dpi. In it the CIS technology (Contact Image Sensor) is used. Moreover, the scanned output (the JPEG/PNG/BMP/TIFF/PDF formats are supported) can be sent to an e-mail immediately (for the business partners or friends to get the necessary information quickly). Through the transparent top board it’s convenient to control the scanning process: use of glass as the main material allows to see all operations. Envy 120 e-All-in-One has a standard connectivity (USB and Wi-Fi), can be operated from smartphones, tablets, laptops. Moreover, it’s possible to charge the battery of a mobile device via the printer. The dimensions of the model are 16.88 x 13.23 in with a height of 4.33 in and with the weight of 17.6 lb. The printer automatically reduces power consumption. In the box are two cartridges – black and tri-color, software CD and a power cord. This entry was posted on Sunday, October 20th, 2013 at 9:10 pm	and is filed under HP, laser, multifunction, printer. "Breakthrough Technology of the Year 1450: The Printing Press"